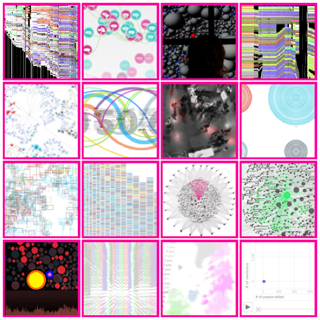 A growing number of projects use information visualization to graph cultural patterns, relationships, and dynamics. The people who are doing this exiting work come from a variety of areas: digital art, media design, architecture, computer science, computer graphics, and others. The breadth of this new area of culture is inspiring - and it also makes it hard to follow its growth. This is why we created Culturevis. Culturevis brings you our selection of best projects accompanied by (highly opinionated!) critical annotations. You will also find a list of resources for doing and thinking about culture visualizations: software tools, sources of data, critical texts. We also suggest a number of preliminary genres in order to help map this new field. The projects featured at Culturevis will be accompanied by critical commentaries written by members of Software Studies Initiative.